The Vermont prison system continues to deny inmates medication for their opioid addictions, despite a new law intended to remove restrictions on the therapy as of July 1. Inmates are being told they will not receive treatment until they have only 30 days left to serve. In practice, this means some prisoners will never be treated, because they do not have a firm release date and are freed with little advance notice. "It's troubling," said Rep. Selene Colburn (P/D-Burlington), who pushed for the law. "We're back to some of the same arbitrary policies that this legislation was trying to address in the first place." Tom Dalton, executive director of Vermonters for Criminal Justice Reform, put it more strongly, accusing the Department of Corrections of "openly and deliberately disregarding state law." Frustrated inmates have submitted more than 100 formal grievances since the law took effect. And as they fight for legal prescriptions, inmates say they are spending hundreds of dollars to buy the addiction medication, buprenorphine, on the prison black market. Corrections officials defend their approach. They say they're simply following the guidance of medical professionals — in this case, the prison system's private health care contractor, Centurion — as the law instructs. Before July 1, the department's policy was to terminate an inmate's prescription for buprenorphine — which combats cravings and withdrawal symptoms and discourages opioid use by blocking the drugs' euphoric effect — after 120 days in prison. It also denied the medication to inmates who didn't have a prescription before coming to prison. The legislature concluded that inmates would have a better chance at recovery, and be less likely to overdose and die upon release from prison, if they could access addiction medication without time limits. Act 176 passed in May with overwhelming bipartisan support. The law first states that such treatment is "medically necessary" for inmates addicted to opioids and then directs the Department of Corrections to provide it to them for "as long as medically necessary." When the law took effect this July, the department was "deluged with requests" from inmates, according to Annie Ramniceanu, the department's addiction and mental health systems director. 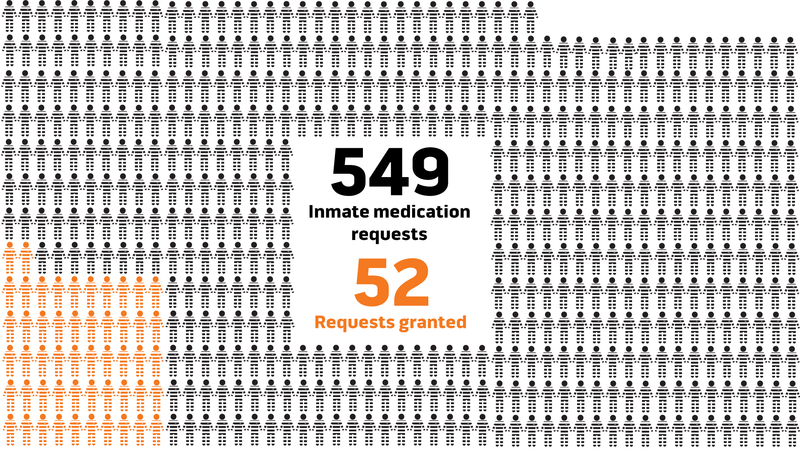 As of last Friday, 549 inmates — nearly 32 percent of the state's prison population — had asked for a medical appointment to determine whether they qualified for the medication. After what Ramniceanu described as a "full-court press," Centurion staff eliminated a backlog of several hundred inmates waiting for appointments. "I think that we've made incredible progress on a very daunting task," Ramniceanu said. Corrections officials have also extended treatment for an additional 192 inmates who arrived after July 1 and who already had a prescription when they came into prison. Inmates without a prior prescription, however, have had less success obtaining treatment behind bars. The department had put 52 such inmates on the medication as of last Friday. When July 1 came, Michael Francis, 32, was ready. Weeks earlier, he'd had his girlfriend print out a copy of the new law and send it to him at the Northern State Correctional Facility in Newport. "I have been trying for 18-plus years to get it under control," he said of his opioid addiction. Francis submitted a request to be screened for treatment by the prison's medical staff, and when he didn't hear back, he filed another. Three more requests and two months later, he got his appointment last Thursday morning. During a phone interview later that day, he recounted asking the nurse how soon he could start treatment. "She said, 'Oh, not until you're 30 to 45 days 'til release,'" he recalled. Francis, who is serving time for several crimes, including possessing stolen property and driving a vehicle without the owner's consent, doesn't know when he'll get out. His earliest possible release date was last February, but he still has a pending charge for aggravated domestic assault. Four other inmates told Seven Days that Centurion staff members have informed them that treatment is "medically necessary" for them — but not until 30 days before they get out of prison. Dalton said he's been in touch with at least 25 inmates seeking buprenorphine prescriptions, none of whom have gotten it. Several were released without it, he said. "It's really disappointing and upsetting that a law that has so much potential to do so much good isn't being implemented in a way that will allow that to happen," he added. Corrections officials deny responsibility for the 30-day standard. "It's not a DOC policy," said Ramniceanu, explaining that the standard originated with Centurion. "The medical provider has made the determination that [the medication] will be necessary 30 days 'til release. So again, it's not a policy. It's a medical practice, based on the evidence. "DOC really feels that this should be a decision made by the medical staff, not the department," she emphasized. According to Ramniceanu, Centurion conducted "a tremendous amount of research," consulting studies and addiction experts before arriving at this 30-day standard. One source that informed Centurion's decision, Ramniceanu said, was a 2016 paper issued by the National Commission on Correctional Health Care. In prisons that opt to stop medicating inmates held longer than six months, the commission recommended resuming treatment 30 days before inmates are released. The paper notes that there is less evidence about the effectiveness of addiction medication for imprisonments lasting longer than six months, but it recommends that treatment decisions should be made "on a case-by-case basis" — a guideline inmates say Centurion hasn't followed. "The way [Centurion] is interpreting things is that we should start from the most restrictive, limited approach," said Senate President Pro Tempore Tim Ashe (D/P-Chittenden), who cosponsored Act 176. "Of course there's less evidence, because it hasn't been done," he continued, pointing out that Vermont is at the vanguard of prison treatment programs. "It's the chicken and the egg," Ramniceanu acknowledged. "We don't know what we don't know." But, she maintained, "DOC really feels that this should be a decision made by the medical staff, not the department." Seven Days requested an interview with Centurion's medical director, Dr. Steven Fisher. He responded by email that "I have been instructed by Centurion legal that we have no comment or statement at this time." The 30-day standard prevents inmates without a firm release date from receiving any treatment. In some cases, inmates remain stuck in prison until they can line up acceptable housing; if an apartment or a bed in a sober house suddenly opens up, the inmate might be released with only a few days' notice. Prisoners say medical staff have told them they won't get medication unless they can take it for at least 14 days before they are released, further narrowing the window in which they can receive treatment. Critics of the current policy contend that treating inmates early on may give them more time to stabilize — and they point out that those receiving addiction treatment outside of prison aren't subject to such time constraints. "I think the trajectory of thinking in the state of Vermont ... is that you want to get the right treatment plan in place as soon as possible," Ashe said. "Our intent was to get people the treatment they need when they need it and not have arbitrary deadlines." Ashe said he aired his concerns with Secretary of Human Services Al Gobeille last week. During a later interview, Gobeille hinted that change could be in the works. "I would imagine this 30-day thing would evolve quickly," he said. But he also defended the current approach, saying, "Some real thought went into it." Some inmates have lost hope. "The culture around here hasn't changed," inmate Isaac Jacobs wrote in a letter. "95 percent of the medical staff are against the [medication-assisted treatment] Program and that [percentage] is the same with the Correctional staff." Jacobs said he filled out three medical slips, two other request forms and two grievances before he got an appointment. He was told he qualified for treatment but would have to wait until 30 days prior to his release. "Why can they get away with this??? Can they?" he wrote. Francis said he's filed a complaint against Fisher with the Vermont Board of Medical Practice — a step that Dalton also took. Francis plans to sue the corrections department for, in his view, ignoring new treatment law. "For some reason they think they're above the law," Francis said. "No one is — hence the reason I'm here." Meanwhile, inmates report that the black market for buprenorphine is flourishing in state prisons. "They're doing what they have to do to get their meds," said one inmate's spouse, who requested anonymity to discuss illegal activity. Her husband sought treatment under the new law, but he, too, was told he'd have to wait until 30 days before he was released, she said. The woman said she had been paying a corrections officer to smuggle buprenorphine into the St. Albans prison for her husband and alleged that "there's multiple [correctional officers] that do it." Another correctional officer, at the Newport prison, was fired and is currently under investigation by the Vermont State Police for allegedly smuggling narcotics to inmates in that prison, according to Deputy Corrections Commissioner Mike Touchette. Francis said a single eight-milligram strip of buprenorphine sells for between $250 and $400 in the Newport prison. He buys them when he can, "but it kills me, because I know I'm spending way more money than I should." Referring to his children, he continued, "I could be spending that money on their college fund or their first car."